Disclosure: This is a sponsored post on behalf of Monkey Up. However, my love of the movie is all mine! 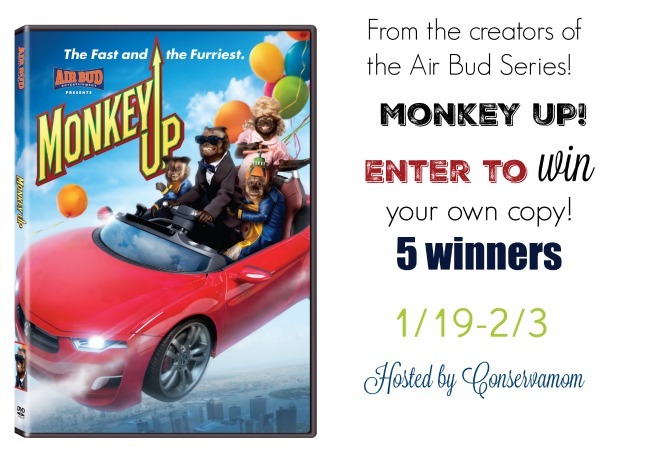 Air Bud Entertainment, the creators of the beloved ‘Air Bud’ and ‘Air Buddies’ films is proud to debut an all-new family movie, MONKEY UP, on Digital HD January 19, 2106 and DVD February 2, 2016. This is a hilarious and heartwarming movie for the whole family. Meet Monty — a precocious actor, spokesperson and… a talking Capuchin Monkey! He’s the face of the energy drink, ‘Monkey Up,’ but he dreams of becoming the first award-winning monkey movie star. When the greedy owner of Monkey Up has other plans for Monty, the chase is on! He escapes with the help of his new family, the Andrews, and his hilarious primate siblings, Mort, Mooner, and Melody in an uproarious chase that proves Monty really is the ‘fast and the furriest’. Together they help Monty discover that fame and fortune come and go, but family is forever! Marking the first time Crystal the monkey has landed a starring role, the film has been rated ‘Family Friendly’ by The Dove Foundation. This recognition is awarded to movies, DVDs, made for TV movies and specials, books and other entertainment products that portray and encourage positive values. The creative force behind the #1 live-action, direct-to-video movies in the family category for decades, MONKEY UP is produced by Air Bud Entertainment, the production team that has entertained generations with their hugely popular Air Bud and Air Buddies movies. MONKEY UP will be released through Air Bud Entertainment’s partnership with Alchemy, the leading independent film and television distributor. Joining MONKEY UP primate star Crystal, are John Ratzenberger (TV’s Cheers, all Pixar films), David Milchard (YouTube sensation Convos with my 2-Year Old), Danny Woodburn (Teenage Mutant Ninja Turtles 2), Erin Allin O’Reilly (Dumb and Dumber to), Jonathan Mangum (House at the end of the Drive) and Skylar Astin (Pitch Perfect 2) who lends his voice to Crystal the monkey in her role as ‘Monty.’ MONKEY UP is directed by Robert Vince, written by Robert Vince, Anna McRoberts, Kirsten Hansen and Mary Pocrnic & Produced by Anna McRoberts. MONKEY UP is rated ‘PG’ by the Motion Picture Association of America (MPAA). Ready to check out this fun new film for the whole family? You can purchase it by digital download on starting today January 19 and it will be available on DVD February 2, will be showing in AMC theaters January 22 – 31! So don’t miss out. The wonderful people at Air Bud will give 5 lucky winners the chance to own their very own copy of this fun movie! So head below for your chance to win. Giveaway is open to US & CA and ends on 2/3 at 11:59pm EST. Must be 18+ to enter! Good luck! No, I have not seen any movies with Crystal the Monkey. I haven’t seen a movie with Crystal the Monkey as of yet. I have yet to see a movie with Crystal the Monkey in it. I would love to though. I have seen one movie with Crystal the Monkey, loved it.